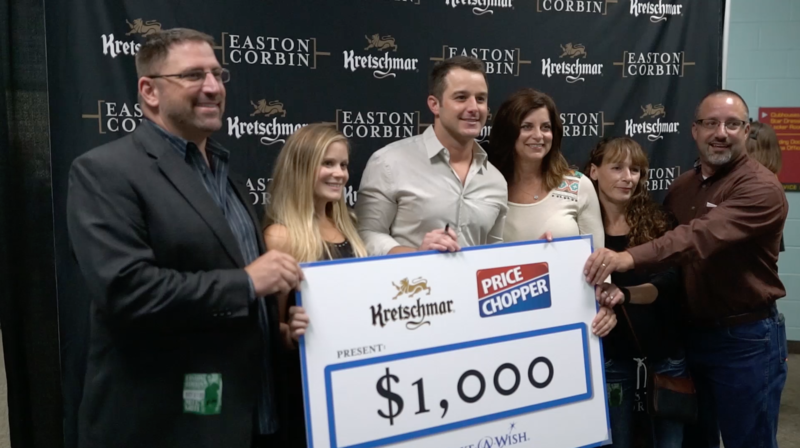 Easton recently teamed up with Kretschmar® and Price Chopper to donate $1,000 to Make-A-Wish® Iowa. Kretschmar made the donation in Des Moines as part of its Legendary Wishes campaign, which helps Make-A-Wish grant wishes for children with life-threatening illnesses. "It was an honor to present Make-A-Wish Iowa with a check for $1,000 to help bring more wishes to life," said Corbin. "I'm proud to show my support for this cause. This is something really special that Kretschmar is doing across the country to make dreams come true for children with life-threatening medical conditions." Since partnering with Make-A-Wish in 2012, Kretschmar has donated more than $600,000 nationally and sponsored more than 12 wishes with local chapters through its Legendary Wishes campaign. "Supporting Make-A-Wish and making wishes come true for children is something very gratifying for us," said Michael J. Sargent, Senior Brand Manager, Smithfield Foods. "Our contribution can support Make-A-Wish throughout the year, and we're thrilled to have the opportunity to continue to help fulfill special wishes for children."